This landmark New York Hotel, located in the heart of the City, has been home to creative minds and distinguished guests for nearly a century. 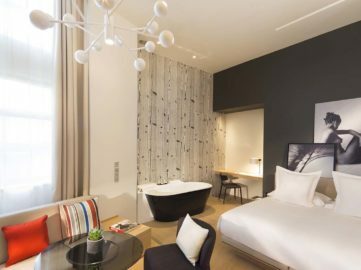 The Hotel is a modern take on a traditional grand New York Hotel, with its custom-designed, handcrafted furnishings and rotating collection of 20th century Artwork, including masterpieces from Andy Warhol and Jean-Michel Basquiat. Every room in this New York Hotel features unique Luxury Amenities — imported Italian linens, exquisite Artwork and luxurious beauty products. Whether dining at Danny Meyer’s acclaimed Italian eatery Maialino or enjoying specialty Cocktails under the soaring ceilings of the exclusive Rose Bar, Gramercy Park Hotel delivers exceptional guest experiences. And with a Rooftop Terrace providing stunning views and a key to Gramercy Park, Manhattan’s only Private Park, Gramercy Park Hotel guests have access to the very best of New York City. One of the truly historic Hotels in New York, Gramercy Park Hotel opened its doors in 1925. Since then, it has hosted some of the world’s most influential stars: from Humphrey Bogart, Babe Ruth and John F. Kennedy to musicians like the Beatles, Bob Dylan, Madonna and U2, giving it the legendary rock-and-roll edge it maintains today. The most comfortable rooms with the most spectacular views filled with the most contemporary of artworks. 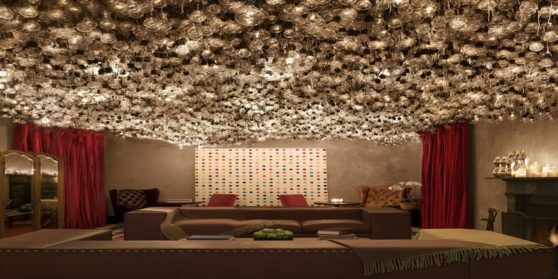 Which art hotel from our list is your favorite?